The zoning Board of Adjustment, Community Development Department/Permitting, and City council will all likely have review opportunities over the new plan. The developer should also engage proactively with the neighborhood organizations. Ultimately, placing a relatively large building on this site with the associated parking will be complicated by the significant north-south slope. 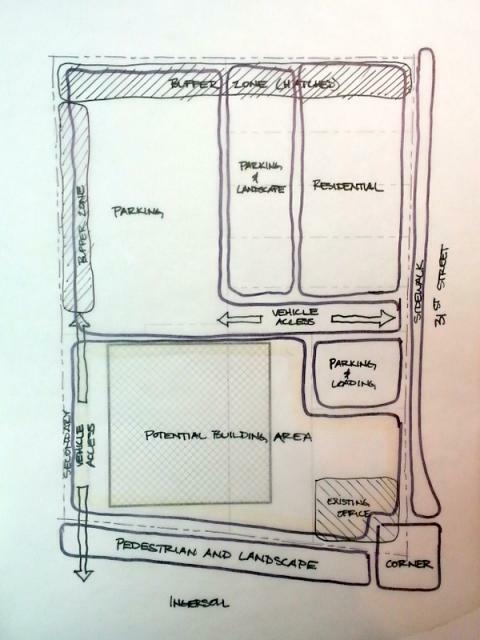 There will be a tension between site planning/vehicle access and pedestrian-oriented design. My gut reaction looking at other "The Fresh Market" sites is that a second floor is unlikely. I didn't see any "urban" stores in their portfolio. Of the ones I looked up the addresses for in the surrounding states, all of them were in suburban-style strip malls with parking up front. This doesn't necessarily mean that they wouldn't attempt a pedestrian-oriented design in this location, just that it doesn't appear to be their standard method of operation. Given the developer's announcement of the prospective tenant for a new building on this site, it is expected that plans will start to "flow" out into zoning and building permits soon.